Suffolk/7 News has started doing a daily tracking poll to gauge the race in New Hampshire. Here are the past weeks' results for Mitt Romney. Fortunately for Romney, that same tracking poll, which shows an erosion of his support in the Granite State, does not show any definite trend toward a non-Romney candidate. During last night's debate, the non-Romneys were more interested in attacking each other than going after Romney. The strategy is to be the last non-Romney candidate in order to take on the former Massachusetts governor one-on-one. 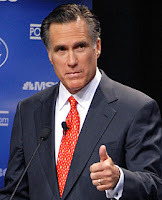 Unfortunately for those candidates they may end up killing everyone off leaving only Romney.